Keady Mountain is the 1074th highest place in Ireland. Picture from group : Cairn on Keady Mt. with Binevenagh beyond. 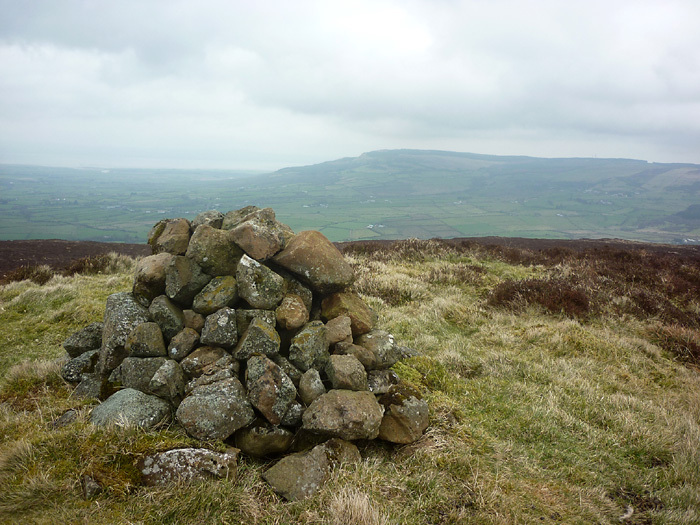 Picture: Cairn on Keady Mt. with Binevenagh beyond. Worth a visit, if only for the views. Take a track starting at C7279123577 A and follow it up E and then N to a ruined TV or radio mast. Continue out NW over the broad grass and heather covered moorland top to gain a low ridge and fence some 200m ahead. At the fence turn left and follow it along noting a small but prominent cairn in the adjacent field on the right at C7289124269 B. The actual high point of the hill will be a matter of debate and personal preference but appears to lie along the fence line or near the cairn. There are fine views across NW to Binevenagh and S to to Donald's Hill and the sharp prominent peak of Benbradagh. Just under 3km up and back.